Cycling safety became a fun lesson in Westborough last weekend, as 100 children learned a few basics about the road and got to take home new bike helmets. 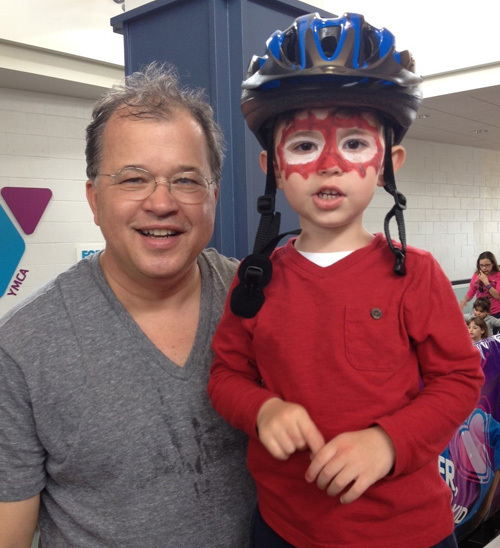 The Westborough Bicycle and Pedestrian Advisory Committee and attorney David White handed out the bike helmets on Saturday at the Westborough Spring Festival and the Boroughs Family Branch of the YMCA of Central Massachusetts. Breakstone, White & Gluck donated the helmets and will donate more at several other events in the Boston area this year. Our goal is to encourage bike helmet use to reduce the risk of head injury among children. This is the second year we have donated bike helmets to children and our first year working with the Westborough community. Each year, 26,000 children and adolescents sustain traumatic brain injuries related to cycling and are treated in U.S. hospital emergency rooms. In 2010, children and teenagers under the age of 20 accounted for about half of all 515,000 bicycle-related injuries in the U.S. The Westborough Bicycle and Pedestrian Advisory Committee’s mission is to explore ways Westborough can become safer for pedestrians and cyclists, work to develop a rail trail along an old trolley line in town and advise the Board of Selectmen on roadway safety issues and preventing bicycle accidents. In addition, the committee is working to encourage private and community investment in bike racks and signage. 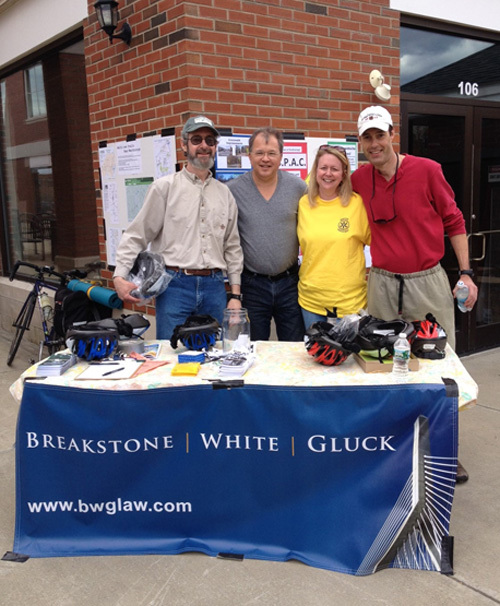 Photos: Top: Bruce Tretter and members of the Westborough Bicycle and Pedestrian Advisory Committee and attorney David White of Breakstone, White & Gluck at the Westborough Spring Festival. Bottom: Attorney David White at the Boroughs Family Branch of the YMCA of Central Massachusetts. Visit our Bike Safety Outreach page to learn more about our bike helmet donation events. You can also read about the event in the Westborough Patch. View photos from Westborough Spring Festival. The Boston personal injury lawyers at Breakstone, White & Gluck have over 100 years combined experience representing clients who have been seriously injured by someone else’s negligence. We donate bike helmets to children who need one because we have represented hundreds of clients who have been injured in bicycle accidents and want to prevent injuries. If you have been injured, it is important to learn your rights. For a free legal consultation, contact us at 800-379-1244 or 617-723-7676 or use our contact form.